This “World Traveler Tough” expedition gear is all custom designed by Chisholm’s Trail to stand up to the toughest demands of archaeologists, adventurers, and those combing the back country for treasure and gold. These items have recently been to some of the most remote ancient Anasazi cliff dwellings and pueblos in New Mexico, such as the Puye Kiva ruins, Acoma Mesa Sky City Pueblo, the Bandelier National Monument, and of course the world famous Chaco Canyon. When you are in that part of the country we highly recommend you visit these locations. The BASE CAMP knife blade has a total length of almost 9″, with a 5″ blade and a 4″ handle. The blade is about 1/4″ thick for a total weight of 9.5 oz. For tough activities such as prying, chopping, and slicing, the smaller blade will fill all of your utilitarian needs. Our custom leather sheath has grommets to lace the sheath to a pack or your leg as needed. The handle is secured with a camo para cord and a length of cord is also attached at the toe to lace to your leg or equipment as needed. . 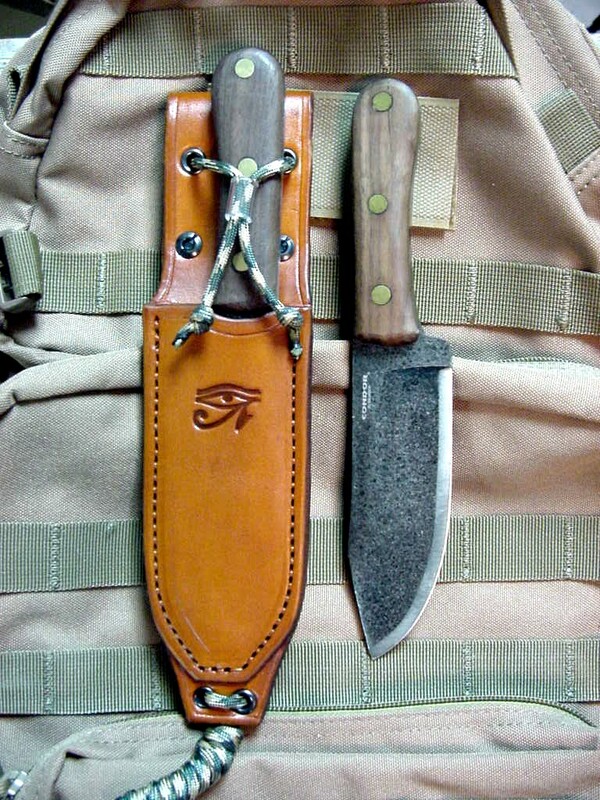 The BASE CAMP knife and sheath is budget priced at $224.95. 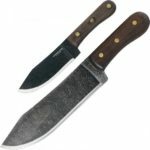 These two knifes are perfect for a back country trek and in camp tasks. We have sourced these blades from a company that began making them in Germany over a hundred years ago using the finest Solingen steel and crafting. In time this style was sent out to other countries to manufacture using the same strict guidelines. Field tested and built fitting to our specs, Both knives are 1075 high carbon heat treated steel and annealed to about 50-55 HRC. The edges are hand finished and polished to a razor sharpness. Both knives have a clip point, convex grind blades and Walnut handles. The antique finish is hand hammered to give a classic antique look with black accents in the pebbled grooves. Both of these blades are made from a special carbon steel that is not prone to rusting if you wipe them down after heavy use with any light oil. Your best choice would be to get both blades for a complete knife task set. 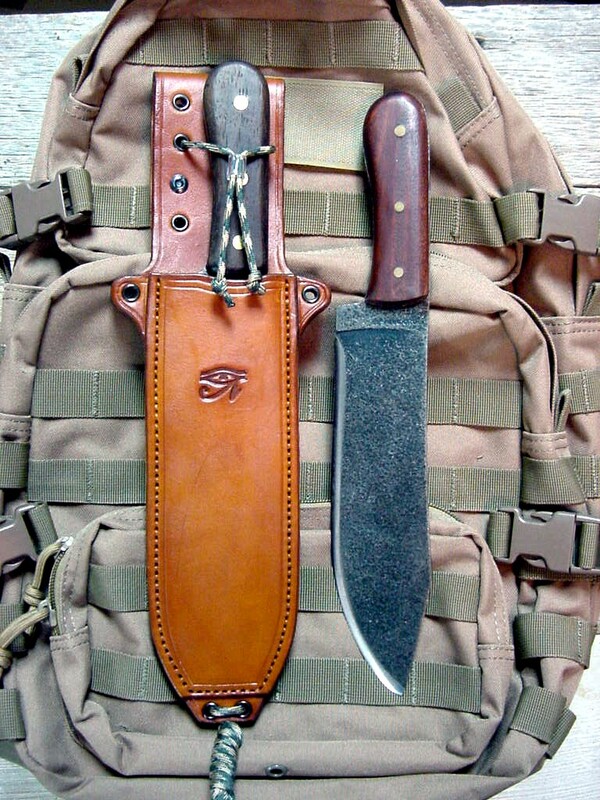 Our Chisholm’s Trail custom designed EXPEDITION scabbard is based on a custom U.S military 1913 large knife sheath. Combat tough with any size loop to fit your belt. It also has blackened solid brass grommets to secure to your leg, or tie to other equipment or a back pack. The BASE CAMP scabbard also has a series of grommet holes to lace to equipment if needed. Both the inside and out side of these sheaths are hand rubbed with saddle finish to retard moisture transfer. The large EXPEDITION knife and sheath is economically priced at $249.95 and the smaller BASE CAMP knife is $224.95. Your choice of color. Buy the pair for $449.95 and save $25.00. Jungle tough, 1 3/4″ wide, 9-10 gauge thick Raider belt with riveted parallel tabs for extra strength and rugged safari look. Solid brass buckle for durability. Buckle attached with Chicago screws so you can interchange buckles at any time. You can choose five or seven holes in the tongue. See the home page for color choices ~ $124.95. Ladies belt 1 1/2″ wide with one strip instead of two. (Photo Pending) Most expedition cargo pants have at least 1 3/4″ belt loops so we have created a dressy looking belt with a two piece buckle with a palm tree on it for an “in country” look. Several extra adjusting holes and hook closure will insure you can fit your waist size. 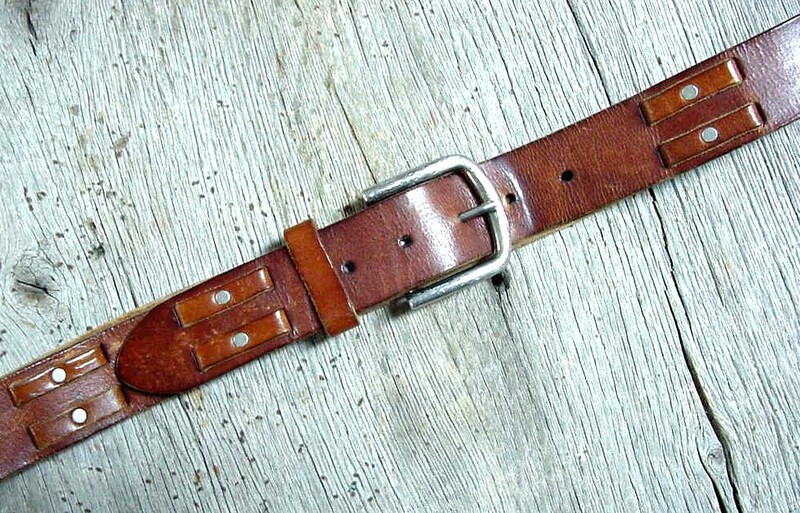 If needed we can make this belt in 1 1/2″ with a different two piece buckle. (Photo Pending)The original will be similar to the ones worn by our World War fighter pilots. One style can be worn across the chest “Bandolier style,” and the other would go over one shoulder and have a chest strap for additional stability. The original is made for a Colt or Smith & Wesson 4″ barrel (N) magnum frame. This size double action revolver usually used the Colt .45 ACP round in half moon clips or Auto Rim rounds that would eject easier. 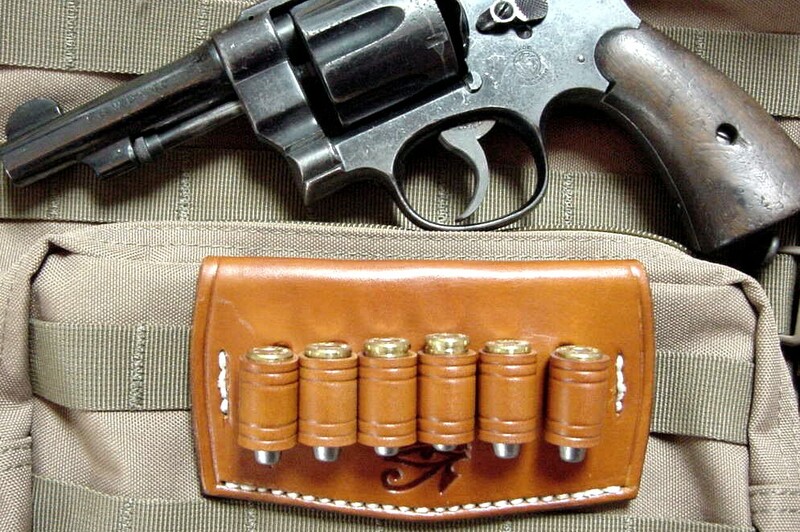 This can also be made for the normal Colt or S&W 5 1/2″ 1917 revolvers. An alternate pattern can be made for the Colt Single Acton or the Colt 1911 Semi Auto. NEW PYRAMID RAIDERS © GEAR COMING SOON: Talking to many world travelers we have found there are several things they would like to see us make such as a leather cover for Passports that can also store your shot immunization record, your international driver’s license, Emergency Information, Critical phone numbers and other data. Several complaints centered on a much more durable luggage tag. Ours will constructed from 4-5 gauge leather, sewn at the seams that will fit a business card size info sheet with a plastic window. The leather will be three thicknesses at the end with a tie wrap to put around your luggage handle. A simple business card holder will be made from leather that will hold a significant number of cards. If you have other needs or input please contact us and will will make it. Sheaths made from three layers of 9-10 gauge Wickett & Craig tooling leather- front, welt, and back. Final back layer of premium pig skin. All sheath front areas decorated with a hand applied edge groove. Sheath hand colored with oil base, Saddle Tan stain. 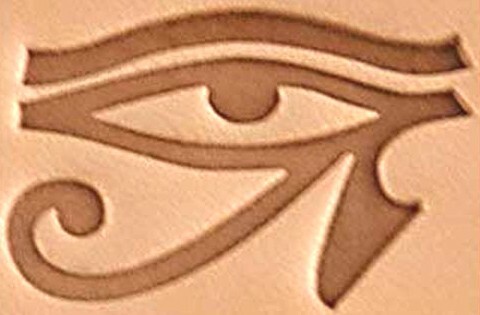 Egyptian Eye of Horus tooled into the front and hand painted chocolate with a camel’s hair brush. Inside and outside of sheath coated with saddle finish to retard moisture transfer to the blade. Sheath seams are hand grooved so thread is not exposed to wear and sewn with heavy duty 346 nylon thread ending in a lock stitch. Blackened solid brass grommets with camo para cord to secure sheath to pack, equipment or leg. Blackened solid brass, open back Chicago screws to secure belt loop. Length of camo para cord used to make a compression slip to secure the knife handle in the sheath. This entry was posted on Thursday, November 29th, 2018 at 6:22 am	and is filed under Uncategorized. You can follow any responses to this entry through the RSS 2.0 feed. Both comments and pings are currently closed.